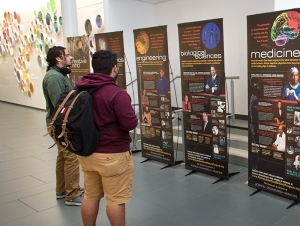 Take a walk through Buffalo State’s Science and Mathematics Complex Atrium and witness the many ways in which African Americans have contributed to the sciences. The traveling exhibit The Creative Mind is composed of seven colorful 7-foot-high panels that celebrate African American leaders, educators, problem-solvers, and pioneers in the fields of medicine, mathematics, engineering, biological sciences, social sciences, and physical sciences. Sponsored by the New York State Master Teacher Program, the exhibit will be on display through October 26. Each panel is filled with photos, profiles, and inspiring quotes from both famous and lesser-known African Americans. Many of the featured professionals are firsts in their field, such as Shirley Malcolm, a zoologist and ecologist who now serves as head of education and human resources for the American Association for the Advancement of Science. Organized by the National Academy of Sciences, Engineering, and Medicine’s African American History Program, The Creative Mind debuted in 2012 at the Franklin Institute in Philadelphia and the Koshland Science Museum of the National Academy of Sciences (NAS) in Washington, D.C. Three copies of the exhibition have since traveled to 20 museums, libraries, colleges, and universities throughout the country, including Buffalo State. The exhibit’s intention—to both celebrate African American successes and educate students about the myriads careers available to them—matches many Buffalo State goals said David Henry, associate professor of elementary education, literacy, and educational leadership and co-director of the New York State Master Teacher Program, Western Region. He partnered with Master Teacher co-director David Wilson, associate professor of mathematics, to bring The Creative Mind to campus. The exhibit stemmed from a portrait collection staff at the academies developed in the 1980s focusing on approximately 65 African American scientists, said Alana Quinn, senior program associate for cultural programs of the NAS.